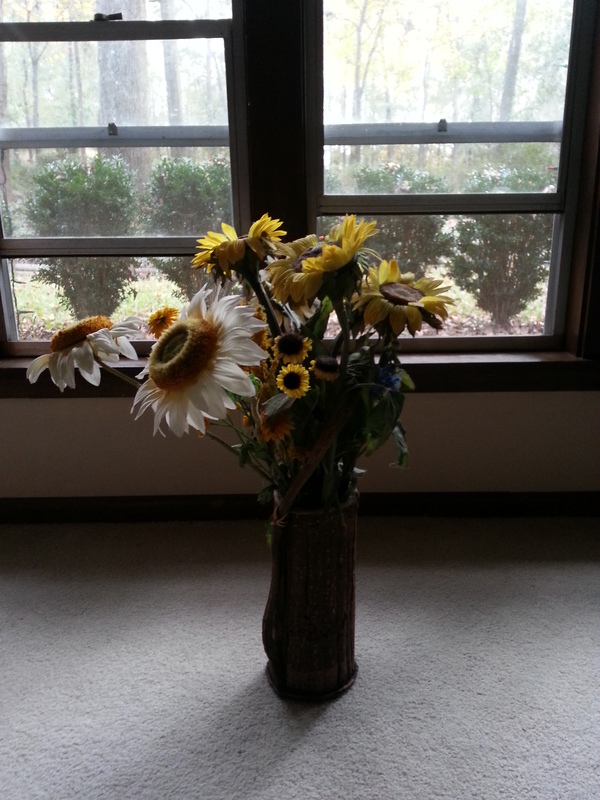 A few weeks ago, my 22-year-old son happily proclaimed this flower arrangement an adequate substitute for a Christmas tree and placed it in this tree-worthy spot. The answer? To tree. Or bush. My husband will accept either. He just won’t accept “not to tree,” which apparently includes the little sunflower arrangement in full Christmas tree position. Typically, we purchase a live (dying) Christmas tree the weekend of Thanksgiving; our goal is to get the freshest tree and enjoy it the longest. For some reason, selecting a tree alone completely stresses me out. I feel pressured to pick the best tree, the perfect tree, and feel the failure if anyone makes a snide comment about the gaping hole due to missing branches in its side or the fact that it has two trunks or some other easily overlooked defect. This year, after stressing over Thanksgiving dinner, I put my foot down and said I would not go to get a tree without my husband. So — we have no tree. Granted, my husband works seven days a week, and when we could have managed an hour together to get a tree, I have been consumed by my seniors’ Capstone Projects or Project Bake-a-lot or Project Cheer-a-lot for my son’s basketball team. We might have purchased a tree, but I wouldn’t have had time to decorate one. Who wants a naked tree standing in her living room? Today is the day before the day before Christmas Eve, and I have no Capstone or other projects to distract me from the task at hand: Get a tree or bush or something! (Then the day after Christmas get an artificial one for half off the regular price so I am never in this spot again.) At the health club, which has been undergoing construction, silver ladders laced with lights and giant blue balls and other decorations grace the facility as Christmas trees. (I have a ladder…) At school, a decorated Christmas trees stands alone and lacks admiring eyes now that school is closed for two weeks. (I have a key and a van… dare I borrow it?) And one of my book-loving friends on Facebook shot a picture of his Christmas tree — made of books and lights. 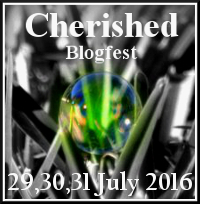 (I have plenty of books!) But, alas, I am awaiting the Home Depot store opening at 8 a.m. to see what sort of merriment I can manage at this late date. 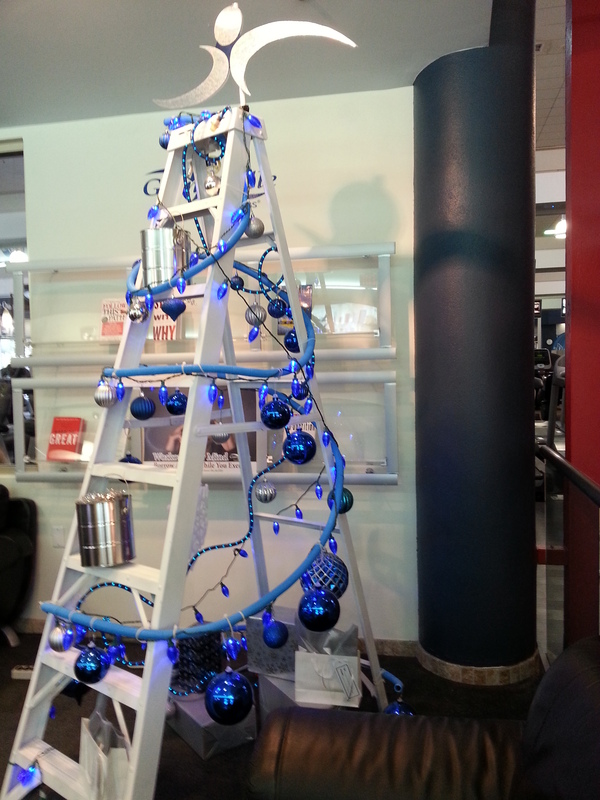 The ladder Christmas tree at the health club — creative and festive. When I was a young child, my parents never bought a Christmas tree until Christmas Eve. Then they never decorated it. That evening, we would wait outside in the snow to see Santa drive by on the local firetruck and we would wave in amazement. (Santa had time to do parades and deliver gifts all over the world.) Then we would go to bed with a large, dark tree — absent of any gifts — in the family room, confident that Santa was near. Just before we would drift off to sleep, we could hear the reindeer hooves clicking on our rooftop, and we had to pretend we were fast asleep so that Santa Claus would work his magic. We must have all managed sleep, because Santa never failed us. On Christmas morning, I had to wait for all of my four siblings to awaken before we could go downstairs. We would wait at the top of the stairs with my mother until my father went down to make sure that Santa Claus was gone. Then we would race to the family room. The undressed tree had been transformed by Santa and his elves — decorated, lighted, glittery and magical. And under it skirted a pile of presents large enough for a family of seven. Oh, how I need Santa now! Inside Home Depot’s Christmas department was not much better. Few artificial Christmas trees had survived the onslaught of shoppers, and those that graced the shelves and floor did not appear worth the price. I began to lament my previous indifference toward purchasing a tree. What if we had to celebrate Christmas without one? I headed toward Lowes, but made a dash into Walgreens as I passed by it. There I found a courteous store manager who showed me the clearance Christmas trees — boxed, but cheap — and said someone could get it to my car for me. 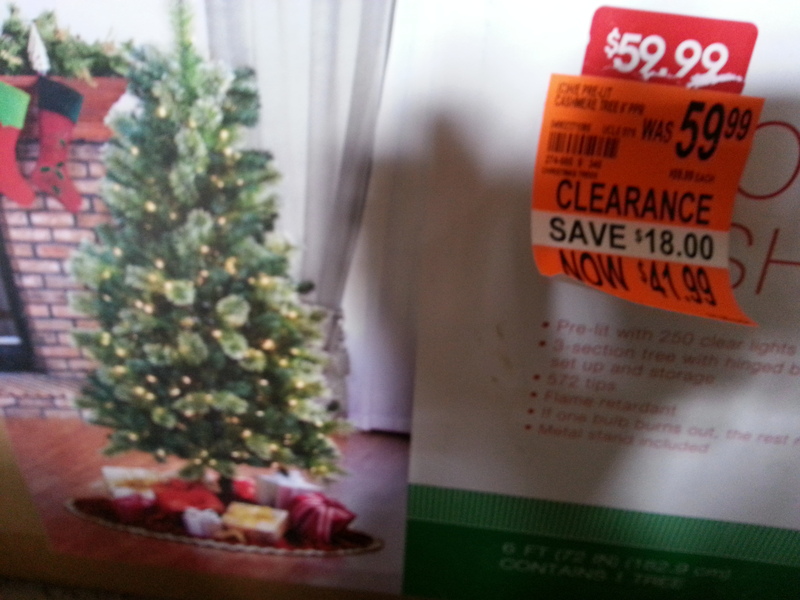 Such a promising little tree for a mere $41.99. I told the manager I would try for a live one at Lowes but might be back. Lowes didn’t even offer a tent cemetery for its trees. All evidence that the company had once sold live ones was gone; the gorgeous artificial trees inside were lovely, but the prices weren’t. 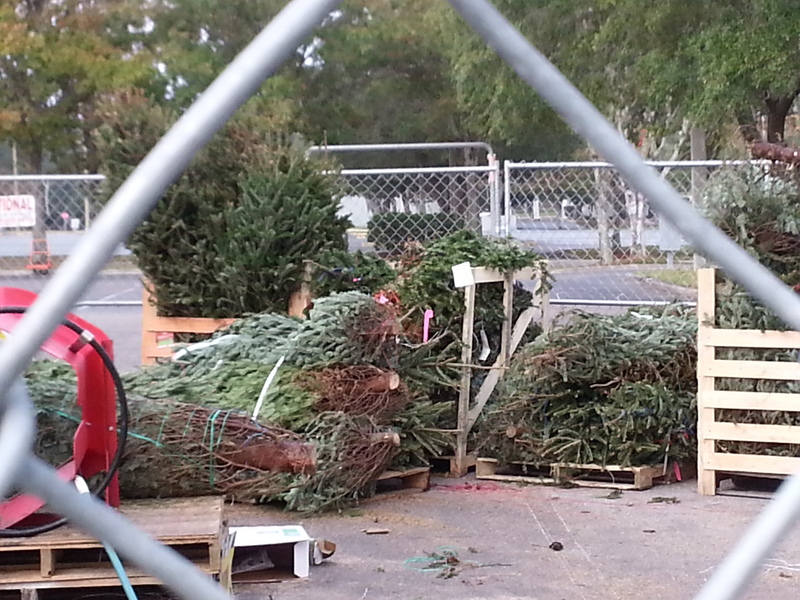 I tried Walmart — and found live trees all bundled up and ready to take. I was too afraid to purchase a tree, sight unseen, plus I knew I couldn’t handle tying it to my van roof. Risk and risky effort weren’t worth it. I went back to Walgreens, definitely feeling uncertain, but the manager assured me I could return it if my husband disliked it. 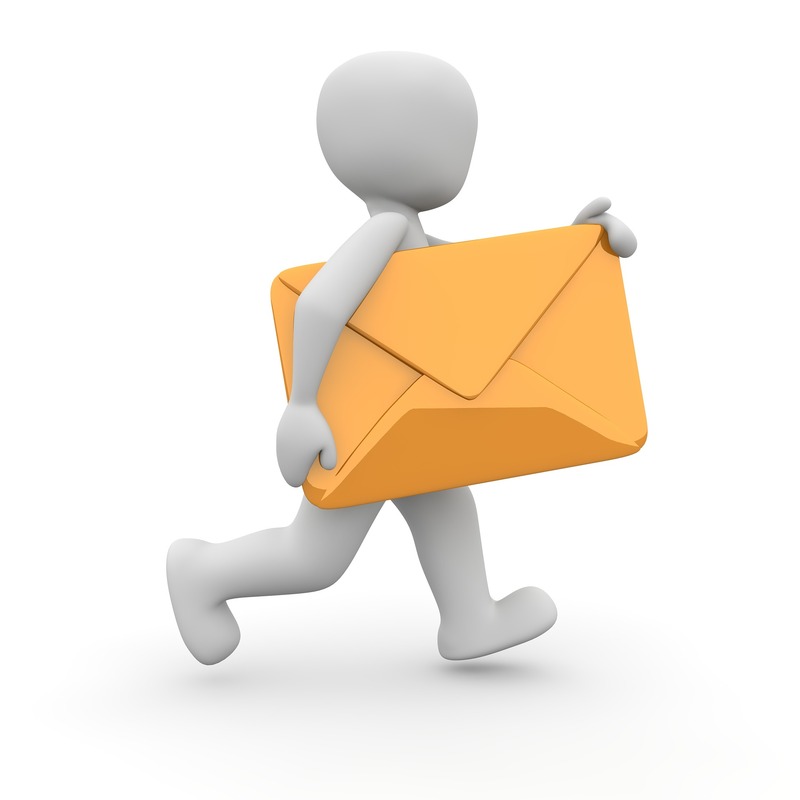 Still feeling uncommitted, I headed home, where my 17-year-old son greeted me. As soon as he saw the artificial tree, he asked if he could put it together. I suddenly felt more committed. Artificial tree purchased for the price of a live one — and I won’t have to go back after Christmas to buy one on sale. Score! 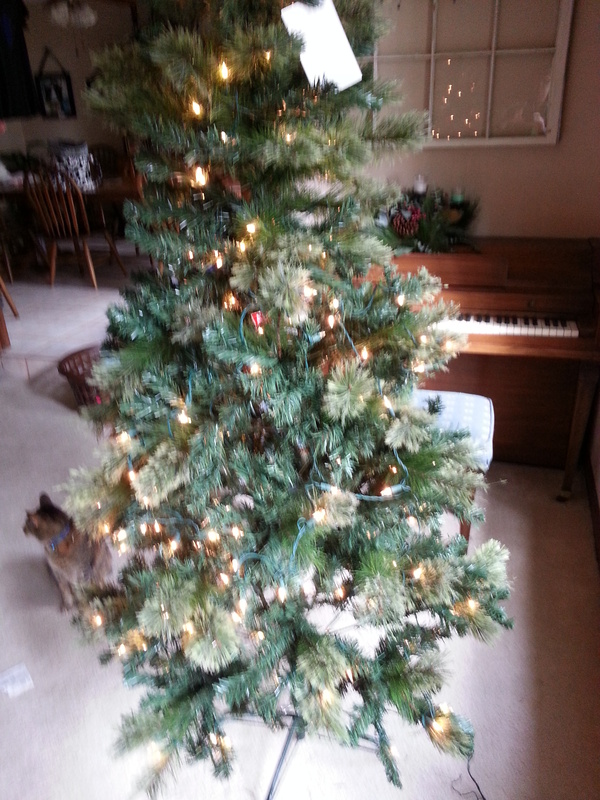 A little fluffing and some additional lights might make this a jolly little tree. My lack of enthusiasm for the holiday has apparently caught on. Where is Santa when you need him? My husband arrived home and scoffed at the “bush.” I remembered why I initially refused to go without him; now I clearly remember. He actually offered it to my daughter, who was visiting, and rolled his eyes at one point. Of course, he thinks he’s just kidding… he’s really finding himself a job tree hunting in the future. My 22-year-old arrived, laundry and a package of Taco Bell in hand (for himself). When I told him I’d gotten a tree today, he came and looked, and then he said. Previous Previous post: Shortest day of the year… Thankfully!